I have a cold at the moment and so I’m carrying a bottle of water around with me. Last might I filled that bottle of water and stuffed it into my bag in my rush to get home at a semi-reasonable hour. Alright, what’s the problem? I hear you ask. I didn’t put the lid on properly! 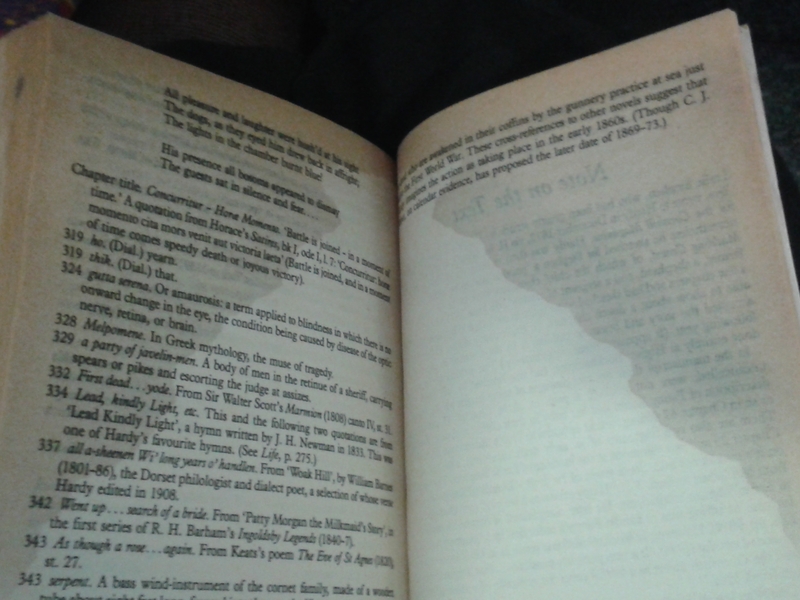 And next to the bottle in my bag was my book of the moment (Far From The Madding Crowd by Thomas Hardy in case you’re interested) which resulted in one sopping book which even now, at lunchtime the day after the event, is still not dry. Still, it’s not as bad as that time I put some fish pie with a badly fitting lid in my bag….. I remember there being a poster for this book on the wall of my library at primary school but I never really knew what it was about so I never got round to picking up a copy. Then a couple of weeks ago three events occurred, the stars aligned and the upshot was that a copy of Noughts & Crosses landed on my doorstep. When I opened it though I was immediately thrown into confusion. First I’d unwittingly purchased a hard back copy which is hardly ideal commuting material. Second this book was entitled Naughts & Crosses. ‘Have I been reading the title wrong all these years?’ I immediately asked myself. So I looked up on the Internet and no, I’d not been temporarily dyslexic every time I saw it so what was going on? My second thought was that maybe it was an American copy and they use an odd spelling (like sulfur, color, realize and all those other examples we Brits love to list). So I returned to Google and very quickly got sucked into a world of grammar forums and debates over the correct usage of nought, naught and aught. Anyway it all got a bit much and I decided just to run with it but for the purpose of this review I shall be using the conventional spelling with an o (for anyone who’s even slightly interested in this waffle my browser which refuses to acknowledge the existence of British English has tried to correct every usage of nought so I think my hunch about it being an Americanism is correct). Anyway to the book itself. The story is set in a world where continental drift never happened and Pangea is still intact. For various reasons I am aware of after reading Wikipedia the dark-skinned Africans (Crosses) had the upperhand and made the fair-skinned Europeans (noughts) their slaves. Although slavery has now been banned the two races still live in almost total segregation with the noughts living drab, unfulfilled lives while the Crosses laud it up in their mansions and positions of power. So basically we’re talking about 1930’s America but with the colours reversed. Where the names come into it I’m not quite sure. We have two alternating narrators – Callum, a nought, and Sephy, a Cross who have been friends since childhood but as they move into adolescence things become more complicated. Callum is acutely aware of his position at the bottom of every ladder while Sephy seems unconscious of the charmed life she leads thanks to the colour of her skin. The world is changing and Callum becomes part of the fight for equality when he is permitted to join Sephy’s prestigious school and gain a previously unachievable education. But things rapidly spiral out of control thanks to a series of uncontrollable events and it seems the world is fighting to keep Callum and Sephy apart. Can their love survive? It was an intriguing concept but I’m afraid I didn’t love this book. The story was good and I think I get the point (racism is bad and illogical whichever side it comes from, obviously something we should all agree with) but I just didn’t feel it. For a start Sephy irritated the hell out of me. Yes, she’s a spoiled brat having been the daughter of one of the most powerful men in the world and had everything money could buy but did she have to whinge so much?? She rarely seemed to feel positive about anything or consider anything from anyone else’s point of view. Maybe that’s an accurate portrayal of a teenager but I for one thought she could do with a bit of a reality check. She seemed to have no understanding of or interest in what Callum was going through, just how it affected her. On second thoughts, maybe that’s not fair, she did try a few times but inevitably what was intended as a nice gesture ended in yet more self-pity. Callum was a more relatable character and I came close to liking him but I felt that all of them lacked some kind of depth. I’m not sure what exactly it is that was missing, just something to make me care. And I didn’t feel any kind of spark between the two of them at all, I didn’t believe in their love at all. I saw a review somewhere that blamed this lack of depth on the fact that it’s aimed at teenagers but I don’t think that’s fair at all, even Artemis Fowl had depth and made me care so how did such a well respected, prize winning author and children’s laureate fail where so many succeed? I have no answer to that. The plot raced along. I’ve mentioned before that I get irritated when I can’t keep track of time and that was certainly the case here. There was at least one occasion when I moved to the next paragraph (no indents, spaces or anything) to find that 5 months had passed! But having said that there was plenty of action so I’ve no complaints there. And I appreciated the ending, I kept expecting her to wimp out but she didn’t so full marks for that. I think one of my main problems with the book is that there was nothing special about it. Yes, the colours were the other way round but it was essentially a rewriting of history, there was no twist and so it seemed almost a pointless gimmick. Why not just write the same book but set it in the US in 1934, why a different world? It didn’t make sense and I kept expecting more. I feel like I’m flying in the face of convention a bit here. It’s the first time I’ve read one of Blackman’s books but I know how well loved she is and it’s rare to find a bad thing said about Noughts & Crosses so to reiterate: it’s not a bad book it just needed a bit more oomph for me to love it. PS. I don’t have Internet at home for the moment but when I do I’ll upload a picture of my book with its confusing a. Check back sometime after the 9th October (!!) if you want to see that. One boy, one lifeboat and one 450 pound Bengal tiger adrift in the Pacific Ocean. I was intrigued when the book first came out but my mum read it and told me it was weird and highly derecommended it (excuse my liberty with the English language). So I wrote it off and got on with reading many other things. Then the film came out. I saw the trailers and thought that it looked amazing but I didn’t want to see the film without reading the book. Then a couple of my friends read the book and told me it was awesome. So I got hold of a copy and gave it a try. The first few chapters were a bit up and down, I enjoyed the first couple with the explanation of Pi’s name and the description of the zoo but then things got a bit…religious. I’m not a religious person myself and while I have no objection to other people’s religion I’d rather not endure lectures about it. There was a lot of talk about religion for a while as Pi converted twice and became a boy who was active in three different religious communities. Having said that it wasn’t particularly lecturey, I didn’t feel like I was supposed to convert so I was fine with reading about Pi’s discoveries and his journey through faith. After all the converting the religion died down except for the odd prayer which was frankly more than justified. The rest of the book was devoted to Pi’s attempts to survive when he is stranded alone with Richard Parker, a non-too-happy tiger. Pi is nothing if not ingenious and the ways he finds to fend of Richard Parker and keep both of them alive as they drift across the ocean are brilliant. It would take an incredible feat of writing to make almost 300 pages of one person and one cat fascinating. But somehow Martel does it. I don’t quite know how but I was hooked. It’s true that a things got a bit weird a few times but on the whole I found the whole thing gripping. I watched the film when I was about halfway through the book which is very unlike me but we’d had it planned for a while and I didn’t read fast enough (I’ve discovered the puzzle page in the Evening Standard and it’s been quite detrimental to my reading time) but apart from giving away the ending it didn’t ruin anything. It’s a very good film but there’s plenty of action they cut out leaving lots for me to enjoy in the book. Admittedly it did give away the twist at the very end but I found I could live with it. Ultimately the story is about the importance of faith, not necessarily of a religious kind but faith none the less and it’s a point which is demonstrated very sweetly. So I’m glad I finally gave this book a chance and I’ve discovered an excellent film adaptation to boot. Happy days all round! That was all I could think when I finished reading it. It tackles such a vital subject with humour and compassion and just the right level of emotion that I think everyone should read it. Sadly it was wasted on me since I am already a firm believer in what this book stands for. Unfortunately much as I detest spoilers it’s impossible to talk about what the message of the book without giving part of the story away. I’m not sure it’s of absolute importance if I reveal this fact, the outcome is revealed on page 1 but it’s the way the story reaches that conclusion that I want to talk about. Personally I don’t feel that knowing what I’m going to reveal would have stopped me reading the book, it probably would have made me read it sooner but if you think it might spoil things for you then know this – this is an excellent book, the characters are wonderfully drawn and the friendship between Alex and Mr Peterson is improbable but heartwarming. Extence leads you gently through the story with a wry wit which gives his writing a lift that makes the book easy to read and as informative as it is emotional. I mean it, stop now. In the book we are first introduced to Alex when he is stopped entering Dover from Calais with the ashes of Mr Peterson on the front seat and a bag of marijuana in the glove box. We then go back in time to when Alex is 10 and an improbable event makes him a minor celebrity. The story then proceeds relatively slowly through the next seven years of Alex’s life and his friendship with the aforementioned Mr Peterson. I won’t talk much about that because I’ve already given some of the story away and I want to leave you some surprises. It is when Mr Peterson becomes ill that the story really takes off and the real meat of the matter begins. For anyone who is unaware, it is a crime in the UK to assist someone to commit suicide whatever the person’s physical or mental state and however clearly they have expressed their wishes. It is a crime which carries a maximum prison term of 14 years. However, a few hundred miles away in Switzerland it is another story. In Switzerland as long as a person is deemed to be of sound mind and to make the decision independently and in full possession of the facts, it is perfectly legal for someone to provide the method and assistance they need to take their own life. There is a clinic called Dignitas which offers this service to foreign nationals and according to Wikipedia they have helped over 1,000 people to die including 180 British citizens (as of March 2012). As you can imagine, this is a hugely emotive subject and one which firmly divides opinion. In the book, Mr Peterson is diagnosed with a degenerative, terminal illness which dooms him to a painful death unable to walk, speak or even swallow. It if a not a fate he wants to face and who can blame him for that? It is with the help and friendship of Alex that he is able to face living his final months safe in the knowledge that when the time comes that he can no longer go on, he will be able to travel to Zurich and end his life in a comfortable fashion and at a time of his own choosing. Alex struggles with this as anyone would but he has a strength of character that allows him to see that this is the most reasonable course of action for his friend and that granting this wish is far from betraying him. The trip to Switzerland and what happens there is written with such a sensitive touch that it is deeply moving and it upset me greatly. Not because Mr Peterson dies, he is always going to die. But because he dies WELL. Something which so many people in my country and around the world are denied. I don’t mean to use this blog as a soapbox to shout about my opinions on this matter but I have seen death and it is not pretty. It is a dehumanising, painful process that robs the dying of peace, comfort and dignity and robs the grieving of their memories. When you have seen the face of someone dying you can never unsee it and whatever memories you have will be forever tainted by that image. That is why I support assisted suicide/euthanasia and why I feel this book is so important. It describes the entire process of Mr Peterson’s death with a detached view which is not intended to shock or to lecture, it just presents the facts. That isn’t to say there’s no emotion, there is plenty but it comes later. Alex is a very calm person and as narrator he does not allow his emotions to get in the way the facts, it’s what makes him the perfect man for the job. I was obviously aware that the end of the book would be sad and it was (I was sitting on a station platform and the announcer came to check on me, I think he was worried I was about to do something stupid) but at the same time it was not depressing. It was right.